Finally got around to score the games. Sorry for the delay, guys. Had trouble mustering energy for anything constructive lately. Congratulations to Landeel for winning another FBGD competition, his 3rd victory in a row! Numeria is a top-down perspective, turn-based puzzle game, with some RPG-elements. You play a space hero pit against an invading alien army, across several different locations, which you battle by solving simple arithmetic problems, as well as rescue hostages. The game also contains few simple puzzles in the same vein spread around the map, that need to be solved for certain areas to become unlocked. 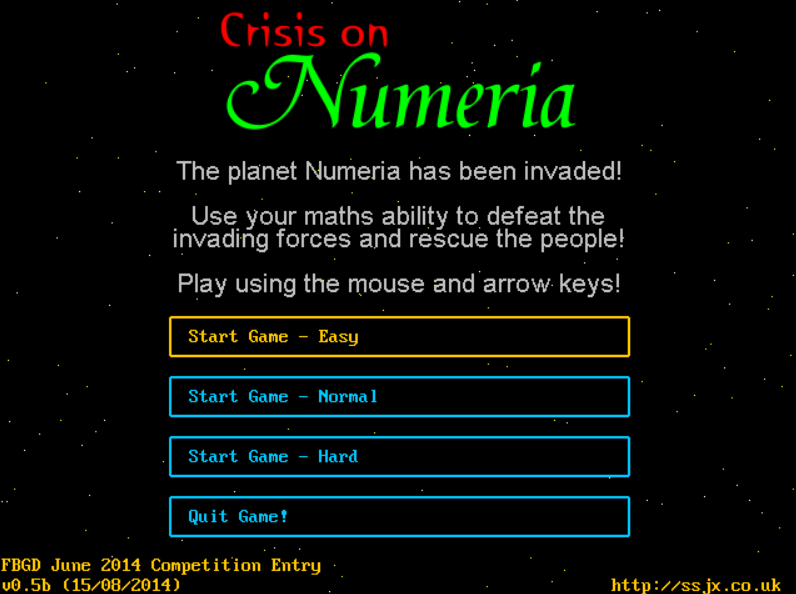 Game design (14/35): Numeria does incorporate the competition theme into its gameplay, but not on a very inventive or exciting way. The gameplay is structured around turn-based movement, as well as around turn-based battles, where the outcome of each battle move is determined on how you solve a simple two numbers arithmetic problem (right or wrong)...without time limit or bonus for faster solving. My biggest complaint lies in the fact that the background behind these "math battles" is not explained/developed. It is not connected with any elaborate story/purpose. It appears more to be forcefully injected than inspired with the setting. When I imagined this sort of gameplay, I always saw it placed in some Pardroid-style setting. 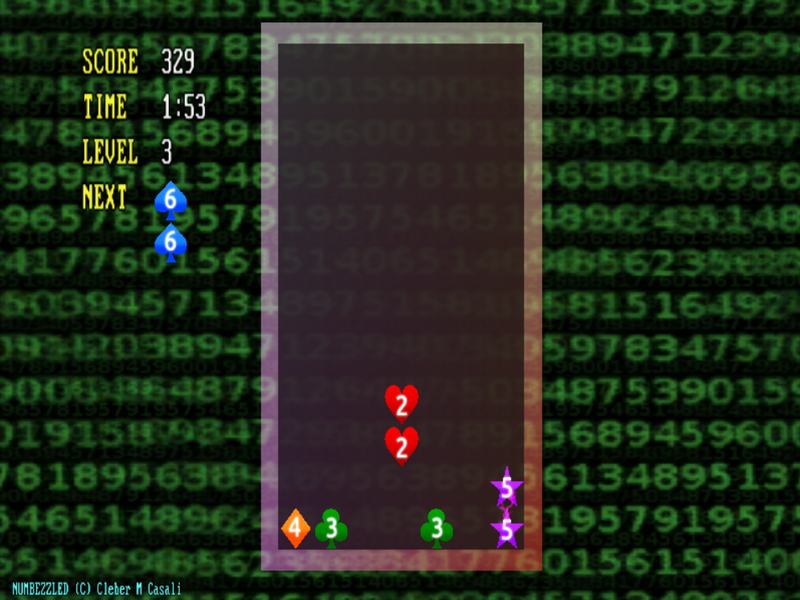 Gameplay (5/15): To me this games fares quite poorly in the gameplay department, because ssjx insisted not to implement time limit to the equation solving, resulting in the challenge value basically being zero, and also making the game tedious in its second half, where the only way to make it more "difficult" was to implement numbers with more digits. This, on the other hand, resulted in more tedious battles, whether the player resorted to using a calculator or not. Having in mind the amount of repetitive kills you need to do to finish the game, most likely you will resort to a calculator toward the end, because there is no apparent fun trying to do it from your head. You are not pit against a time limit, and there are no bonuses for being faster. It just becomes a...unnecessary hassle. I would also complain on the game controls, which I think could have been handled better and often feel like a hindrance. But in the light of gameplay flaws, this is really a minor if not irrelevant complaint. 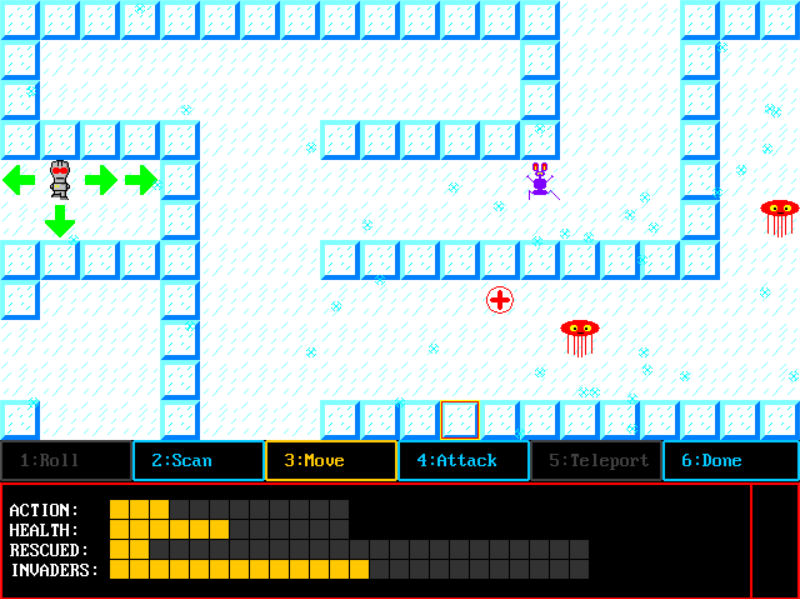 Progression (3/6): It is not a very long or deep game, but does contain a fair amount of different tilesets and new locations that are introduced in a well-paced manner, as well as new skills the player acquires at certain points of the game that do add a small amount of novelty into the gameplay later on. Replay Value (1/6): The game's limited content, lack of secrets or achievements, and tedious gameplay make it rather unattractive to play more that once, maximum twice. Graphics (3/7): It's the usual effort by ssjx, a consistent and solid retro style, but perhaps a bit less interesting that his previous outputs, and also featuring more recycling from his previous works, with less though-out design. It appears like a compilation of stock forest, ice and volcano type of settings, plastered together. Why are these places so close? What do they represent? Someone inhabits these areas? It's all too underdeveloped and placeholder-like. Sound/music (4/7): The game contains some solid music and sound effects that don't feel like a distraction, but also don't terribly enhance the experience. Personal likeness (1/5): I just failed to enjoy this game and had to force myself through it. I really to think it features broken gameplay that could have been easily much more fun and rewarding to play, if ssjx was not so stubborn on keeping it in its current form. Community vote (0/6): 0 votes in the community poll. BTN Slots is a very straightforward slots game, with math symbols instead of typical slot machine symbols. 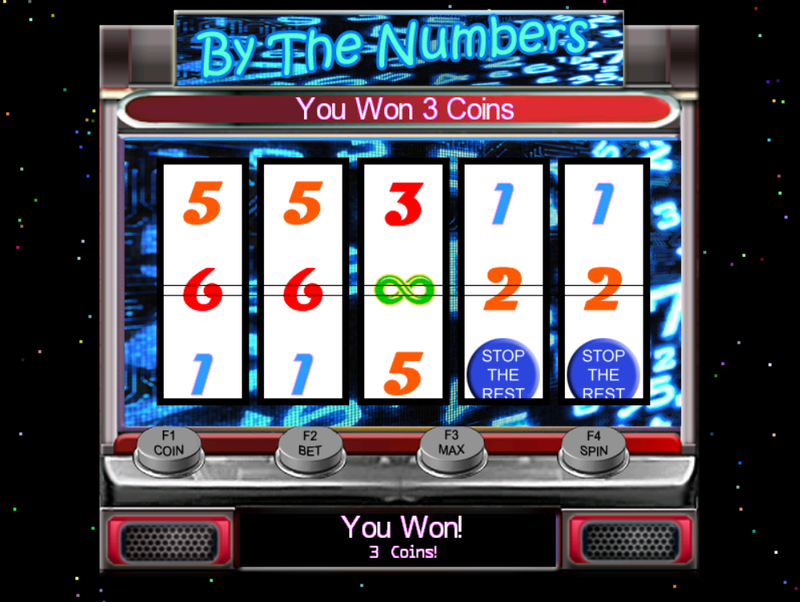 Game design (13/35): Similar to Numeria, BTN Slots does incorporate the competition theme into its gameplay, but on a superficial way, with, for example, PI symbols rewarding you 31, or 314 coins, if you get more of them in a spin. 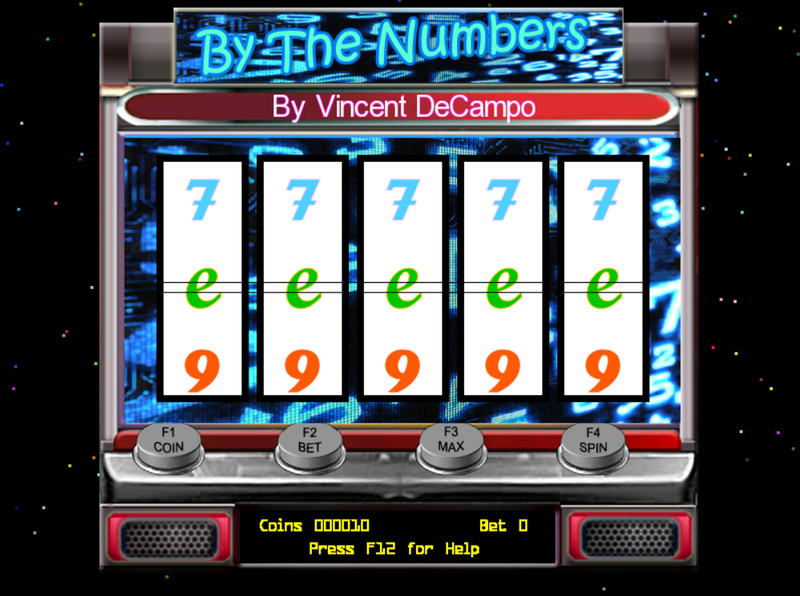 There is nothing more elaborate done to incorporate math/numbers into this version of slots game, like more availability to stop the spin and for example, get bonuses for the last digit being a sum of the first three, and similar features like that. Gameplay (7/15): Not sure what to make of this slot machine game. While I'm not terribly familiar with other slot machine computer games, lack of preset starting cash and inability to lose, or some high scores to beat, make it appear quite unfinished and unchallenging. Progression (1/6): None. It's a slot machine. Replay Value (3/6): For any replay value, it results from the very addictive nature of slot machines. Nothing new to discover, only an illusion you can crack the machine and its patterns. Graphics (4/7): A very solid graphical design that does more than the minimum and feels vibrant and polished. Sound/music (4/7): A very good choice of sound effects and a background ambient sound that makes you feel like you are in a proper casino. Personal likeness (2/5): While the execution is quite solid, I failed to enjoy this game much, due the inability to lose or reach any goals (like beat a high score). Community vote (4/6): 1 vote in the community poll, a tie with 2 other entries. 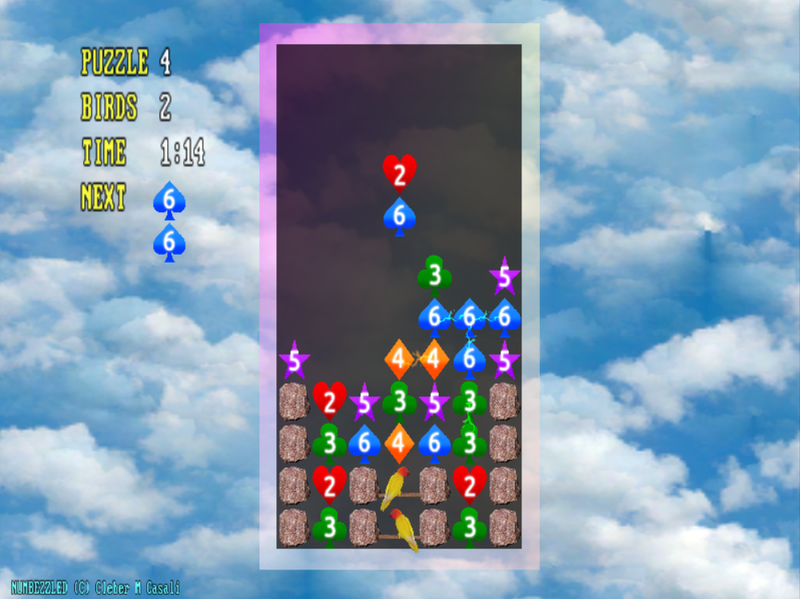 Dominionoes is a single-player dominoes game, played on a 10x10 grid, with some interesting scoring, and a clear goal that need to be accomplished on each map (to cover all stars on the map with dominoes). Game design (23/35): This is probably the most successful entry gameplay-wise, at least in its core. 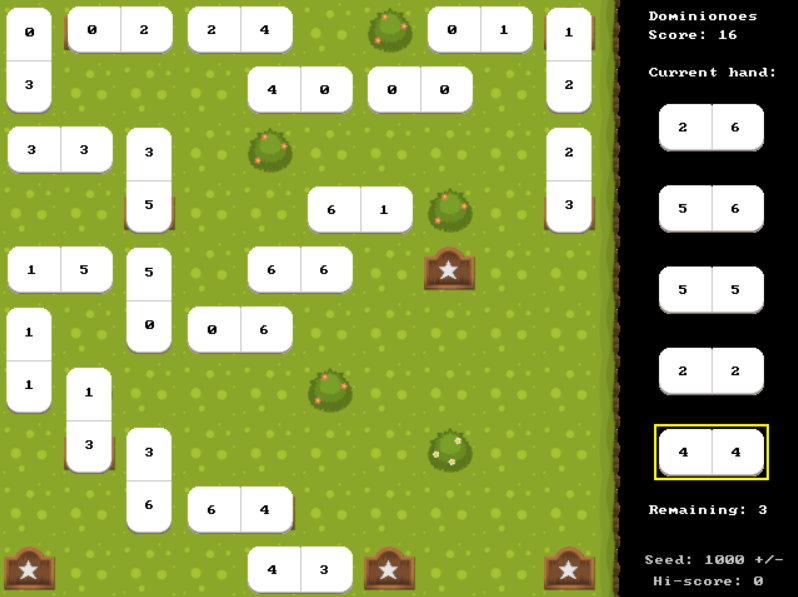 It is a very interesting dominoes concept that pits you against 1000 maps (seeds) of your choice, that you need to solve by aligning dominoes and covering stars (score points) with them, with highest possible domino numbers (or double domino pieces for double points). 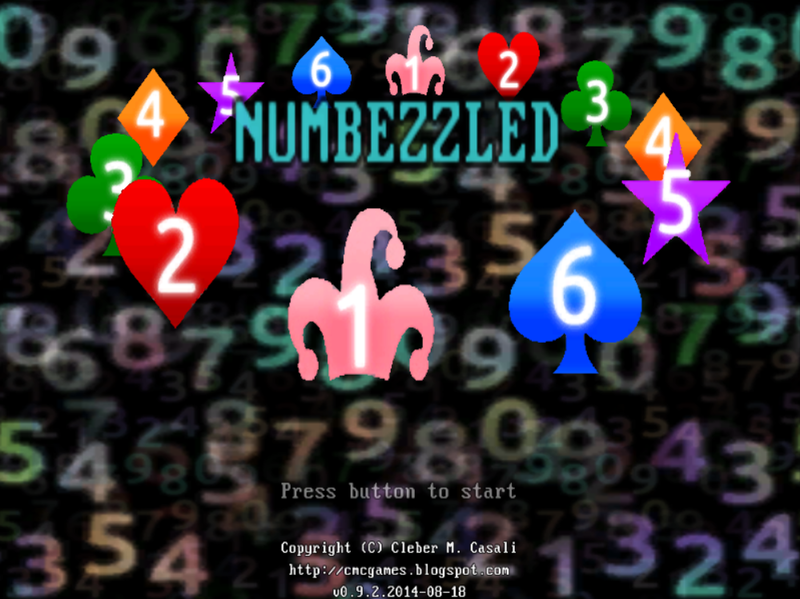 A pure puzzle game, number oriented. What it does lack, in my opinion, is a more elaborate exploration of the competition theme, that goes beyond rehashing an existing dominoes concept. Gameplay (11/15): Very good if not excellent. What it is missing are more fleshed out game modes, that are more rewarding to play, like some mode with preset seeds and minimum scores to accomplish in order to progress to a new map with different graphics, for example. Like I said, excellent concept in its core, but not terribly development beyond that. Progression (1/6): Minimum. Really. One completed seed and all the game features are discovered. Replay Value (4/6): Quite good, but not perfect. If you have friends to play this game with, I can see a lot of replay value in beating each other scores. But playing against yourself, I can see this game become unexciting rather fast. Graphics (3/7): They are solid, but as I understand it, the game contains stock graphics and no attempt was done to make them more exciting (animation, transition, etc). Personal likeness (4/5): A very cool puzzle game that lack a little bit of additional design effort, to feel more like a proper game, besides a cool coffee-break toy. Community vote (6/6): 2 votes total. Only entry with 2 votes resulting in first place in the community vote poll. 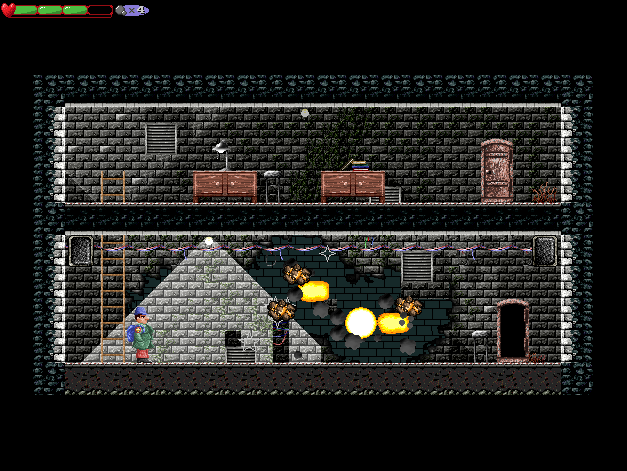 Nomera is an interesting platform game about an American spy exploring remote Russian number stations. Sadly, this competition entry appears to have been hastily compiled and lacks many features, as well as better gameplay balancing. Game design (12/35): The game deals with the competition theme very rudimentary, which is also only story/setting related. What is even more troubling, this design intention seems to have been only partially implemented in this, hastily compiled, competition entry. smooth platform engine, but it also features quite cumbersome, almost broken interaction with the game enemies, that is more often frustrating than fun. I should also mention game features that were obviously meant to be implement, but were left out in the end (like chests scattered around the maps), which make it even more confusing. 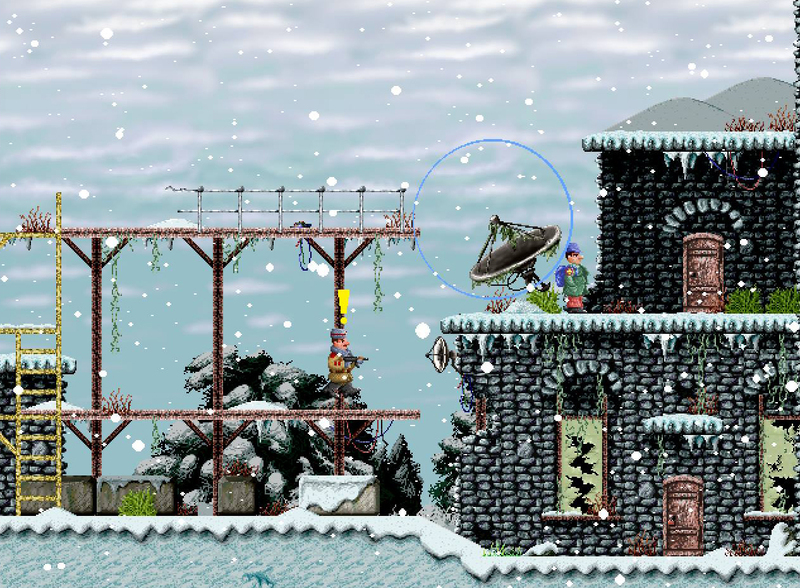 Progression (5/6): Nomera is very good in this sense, although it's a quite short game. Nevertheless, it features very little repetition in its content and each new screen and level is another animal to enjoy and explore, graphics and map-wise. Replay Value (3/6): Due the game's odd loose-ends atmosphere, I'm sure most will feel a need to replay it, to try to get what the heck happened. Still, the fact remains that it is an incomplete game (the competition version), which might also make it feel like an unrewarding experience to certain players. Graphics (6/7): Excellent. Really great work on almost all areas. A very effective and consistent style, quite reminiscent of some early nineties Commodore Amiga games, like Shadow of the Beast. Would love to see more from this artist. My only complaint is on the jump sprite, which is somewhat clumsily executed, and perhaps also on the general lack of more content. Sound/music (6/7): Also excellent, but I would prefer less "arcade-like" sound effects. The music is Zamaster's usual brilliant work. Personal likeness (3/5): Again, I have split feelings about the score in this category as well. In this half-broken form it can hardly compete with any other more complete game, while in the same time it boast with great potential. I certainly hope the developers won't abandon this game or its FB code, just because they failed to compile a competitive contender for this competition. 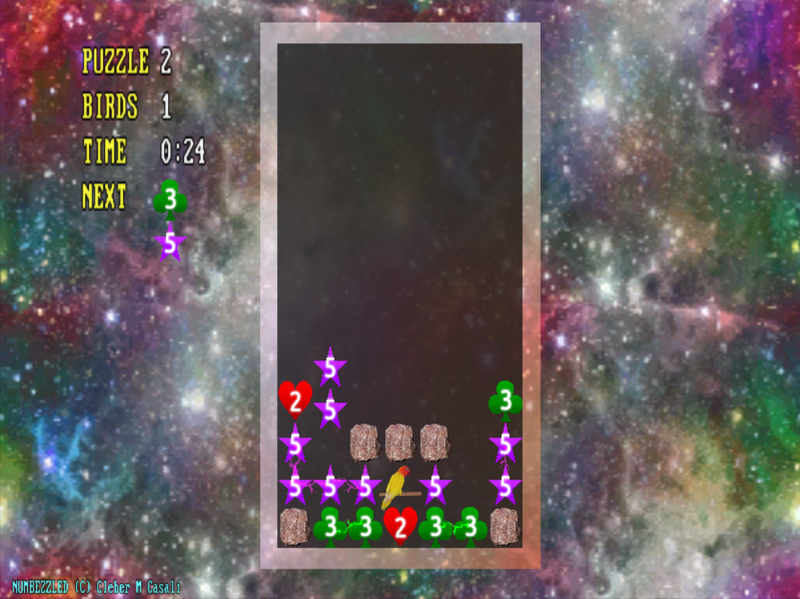 Numbezzled is a falling blocks puzzle game featuring blocks with numbers. The blocks are enumerated and can be destroyed if you connect blocks of the same number, but there is minimum required number of blocks that need to be connected, which is represented with the number symbol on the block. So to destroy blocks with number 4 on them, you need to connect 4 block of this type or more. The game feature single and two player level-based modes, various special items that appear occasionally, as well as a challenging puzzle mode, where you need to "release" parrots trapped by other number blocks and/or rocks. Game design (28/35): Landeel's Numbezzled treats the competition theme on the first ball quite simplistic, but yet this simple idea is also rather clever (and original, as far as I'm aware), and what is most important, results in fun and challenging gameplay that actually introduces some new strategies and aspects into the classic falling blocks concept. Landeel doesn't stop on this basic idea, but develops it properly, with introducing special items and different game modes. 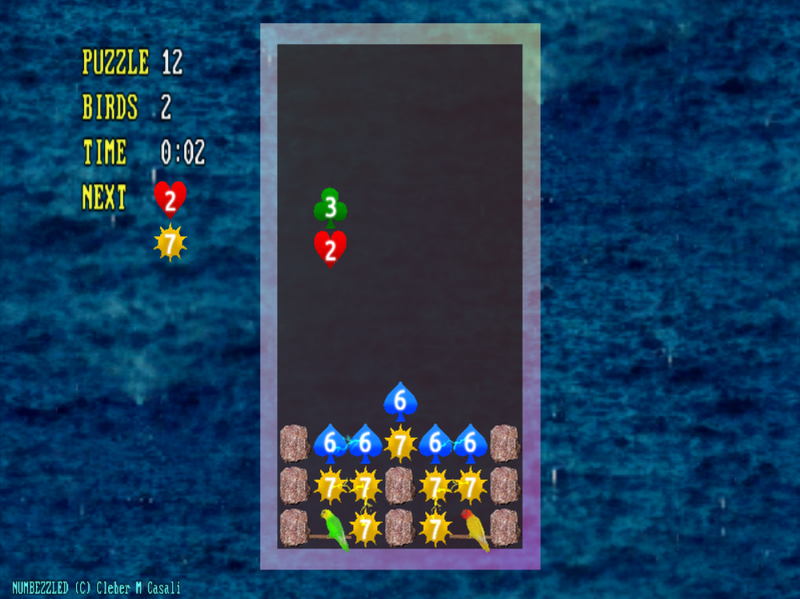 For a higher score I would require perhaps more ingenuity with dabbling with the theme, if not connecting it with graphical design more directly. Gameplay (12/15): Excellent. As I mentioned above, this simple idea results in a surprisingly fun and challenging falling blocks game, that requires more strategy and thinking than the simple "connect the same blocks" logic ever could. The very engine is quite smooth and makes the game very enjoyable to play. Also, the introduction of different game modes and items is a commendable approach, something every game designer should strive for, after coming up with a good idea. Give you good idea justice! Progression (4/6): All modes are level-based and the difficulty curve is very well balanced. Perhaps what game lacks in this departmentis a clearer sense of progress graphics-wise, where now it feels a bit repetitive/random. Replay Value (5/6): With its highscores table, good difficulty curve that rewards experience, and the puzzle mode that saves your progress, I can see myself returning to this game for weeks to come. Graphics (4/7): The graphics are satisfactory, but they feel somewhat impersonal and lack more intention and vision from the designer. They are well compiled, animated and all, but despite that, I think Landeel was least inspired in this department. Sound/music (4/7): Very good and appropriate sounds effects, but I find the brass band tracks terribly distracting. If I only had a choice to choose something less intrusive. Personal likeness (4/5): I cannot give this game a perfect score in this category simply because I was not floored by it. Despite its excellent concept and top notch execution, I feel it is not inspired and exciting as Landeel's previous competition entries. A fun and enjoyable game with a clever concept, but not something that will stick in my memory for years to come, and in all honesty, I remember from time to time playing and enjoying YAGAC and especially Odysseasons. Numbezzled doesn't have that "X-factor" for me. Thanks to all who participated in any manner once more, especially to people who submitted their entries in the end. I'm sorry not all entries managed to be properly completed before the deadline, which resulted in somewhat weaker competition compared to the last two years. It's hard to believe this is our 6 competition so far, and 5th with monetary awards. Wow! It's been a journey. Perhaps we'll end up celebrating 10th anniversary, but even if not, thank you for all the good times so far. Let's make it more difficult to Landeel next year. Congrats to Landeel and Ryan! 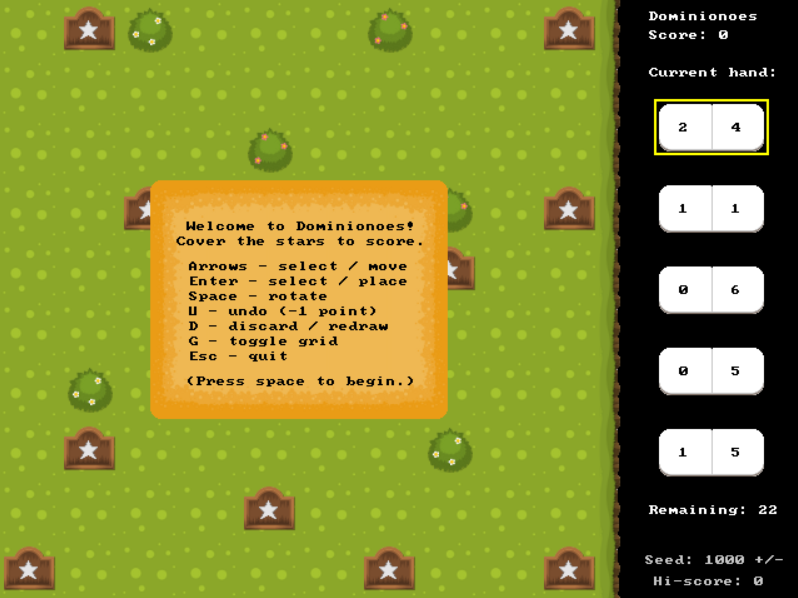 I am making a simpler browser version of my entry ( http://ssjx.co.uk/games/educational/numeria.php ) and it works much better as a quick game without the tediousness and the confusing controls! Thanks for running the comp Lachie and hopefully I can make a better entry for the next one! Congratulations to all competitors and many thanks to Lachie again! We have great games here, great ideas. All of them have potential. I really liked the concept of Numeria. I think with a little more effort it could develop into a great educational game. Dominionoes is a very smart twist on dominos. Very creative. Nomera looks awesome, but it feels unfinished. I hope development continues. And BTN Slots made me feel I was in a cassino. I think Numbezzled could be better, it surely did not achieve all it could have been. Too bad that I never even could make an alpha of my idea. My cardgame idea was far too intricated and not that good. Thanks for the review, Lachie, and for the kind words from other participatns. I definitely intend to develop the idea further and appreciate everyone's encouragement and honest feedback. Congrats to you Landeel and for everyone who submitted something! Damn, I forgot to actually pay the people who won. Just wanted to confirm I have received my prize, so a big THANK YOU to Lachie again. And yeah, I will spend it wisely.